The land price includes escorted transfers, private excursions with professional guides and chauffeurs (except at Los Notros, where the excursions are shared with other hotel guests, and on the Iguazu Falls boating excursion), entrance fees, selected category of accommodations, gourmet cuisine, all land and water transportation, and travel insurance for guests through the age of 59 years (over that age, there is a supplementary fee). All prices are per person based on two people sharing a guest room. Higher rates apply during the holiday season. For a detailed description of our services, see Opulent Itineraries. Buenos Aires is fascinating. It never sleeps and has wonderful architecture and charisma... The bird tours and canoe trip and... various restaurants were all tailored to our wants and much appreciated. Iguazu Falls really are a wonder of the world. Unbelievable. Our guide was great... birding was great... El Calafate was a good choice for us also. The Hosteria Alta Vista is set in the most breathtaking scenery with some of the best meals we had anywhere. Perito Moreno Glacier and the park were stunning, but we enjoyed the mountain vistas and the truck rides, bird watching and trekking even more... Just when we thought nothing could be more spectacular in Argentina, we arrived at the Cavas Wine Lodge in Mendoza. Highly, highly recommended. The accommodations are stunning... So as you can gather, we loved this trip... Thank you, Martin, for once again for arranging such unique places to stay and dine, and for tailoring the activities to our preferences. De Luxe category of accommodations are shown first, followed by Imperial category. Day 1: Arrival in Buenos Aires, Argentina. Arrival this morning, reception and transfer to your luxury boutique hotel, Legado Mítico. Each room is themed to a prominent personality in the history and culture of Argentina. 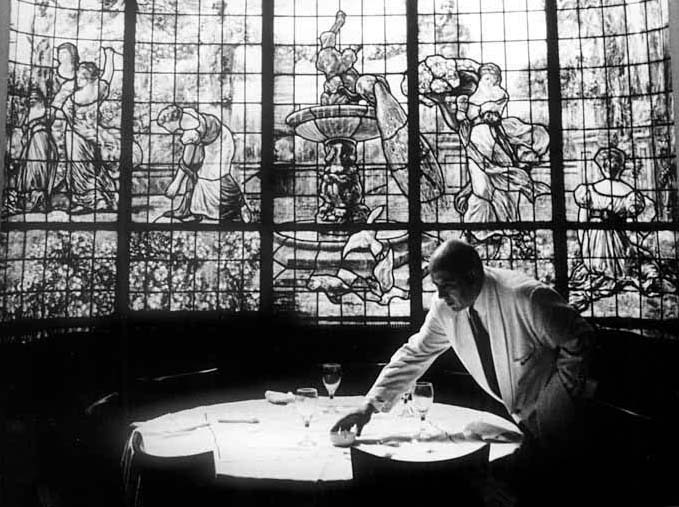 Lunch at Las Violetas (with its famous stained-glass windows). This afternoon, choose from a wealth of cultural excursions reflecting the sophistication of this great metropolis, such as Arts & Crafts by Georgina Kiernan, an expert in Latin American contemporary art. It features visits to galleries, art exhibitions, street fairs and artists' studios. Or take in The Museum Mile, where you will view world-class collections of Latin American, Argentinean and European art. Return to your hotel. Dinner of nouvelle French cuisine by chef Rodrigo Sieiro at Nectarine. Overnight in Legado Mítico -- Mythical Classic Room (De Luxe) or Mythical Deluxe Room (Imperial) -- King Bed. Day 2: Buenos Aires. Your guide will meet you at the hotel for a tour of Buenos Aires in a private car. Our Four Balconies of Buenos Aires is an exclusive visit of the city, in which a scholar uses four parks and plazas of Buenos Aires to introduce visitors to Argentina, its history, its contrasts, its contradictions and the characteristic psychology of the “porteños”, the inhabitants of Buenos Aires. Lunch at El Alvear Palace Hotel's L'Orangerie. In the afternoon, choose another excursion, such as wine tasting with Alejandro Frango. With your guide -- a true connoisseur -- you will sample a selection of the best Malbecs of Argentina, perhaps the best in the world. This evening, dinner and a show at El Cabaret, which presents Rojo Tango, the history of Tango from its beginnings in the cabarets of turn-of-the-century Buenos Aires to Piazzolla's avant-garde vision. Overnight in Legado Mítico -- Mythical Classic Room (De Luxe) or Mythical Deluxe Room (Imperial) -- King Bed. Day 3: Buenos Aires - El Calafate. This morning's architectural tour, Buenos Aires through the Centuries, encompasses the Babel of styles generated in four hundred years of the city's history -- from Colonial to Neoclassicism, Italianate, French Academicism, British Influence, Art Nouveau, Industrial Architecture, Art Deco, Rationalist and Post-Modern. Lunch at Croque Madame. Transfer to Aeroparque Domestic Airport for the flight to El Calafate. Arrival, reception and transfer to Hostería Alta Visita. Dinner and overnight in the Hostería Alta Vista -- Standard Room -- Twin Beds. Day 4: El Calafate (Perito Moreno Glacier). A full-day tour of Perito Moreno Glacier with a hike over the glacier. 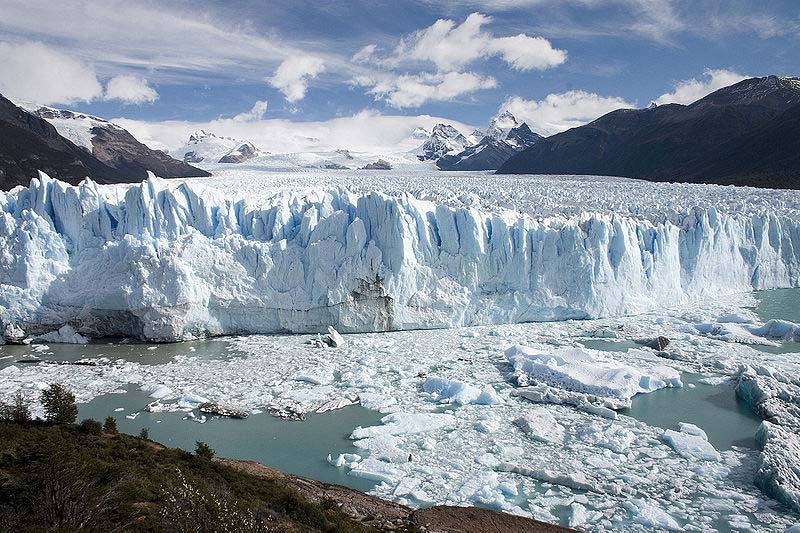 Perito Moreno Glacier is the Los Glaciares National Park's most famous and imposing glacier. It is permanently advancing along its 3-mile-wide front, which is a wall 200 feet high over Lake Argentino. Visitors invariably observe great blocks of ice breaking loose from this wall and falling thunderously into the lake, making huge waves, later surfacing to form icebergs. The wildlife includes Andean condors, buff-necked ibis, black-chested buzzard eagles and ashy-headed geesem, among other creatures. Box lunch prepared by the hotel. Return to your hotel. Dinner and overnight in the Hostería Alta Vista -- Standard Room -- Twin Beds. Day 5: El Calafate - Bariloche. Choose from a variety of activities at the hotel. Lunch at Alta Vista. Transfer to El Calafate airport to take the flight to Bariloche. Arrival, reception and transfer to the Llao Llao Hotel & Resort. This hotel is a destination in itself, a beautiful building located in one of the most amazing landscapes in Patagonia. Undoubtedly one of the most extraordinary landscapes in the Western Hemisphere is found in the Meridional Andes. For this reason, a chain of Argentine national parks protects this natural beauty. Dinner and overnight in the Llao LLao Hotel & Resort -- Lake Room (De Luxe) or Deluxe Moreno Lake Studio (Imperial) -- King Bed. Day 6: Bariloche (Hiking & Kayaking). 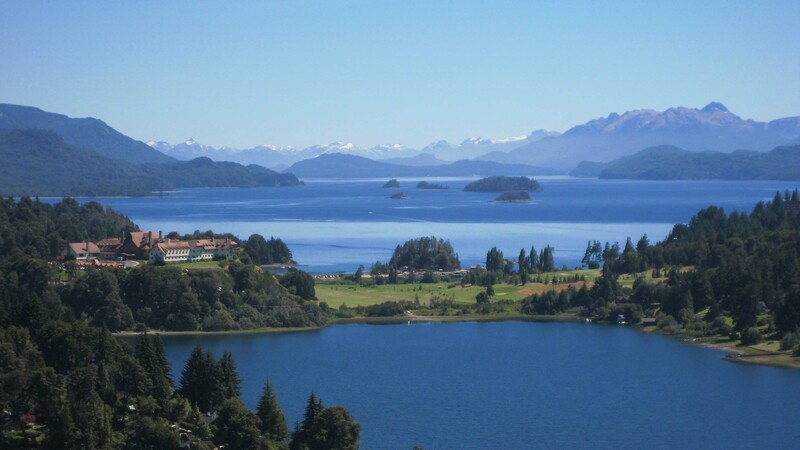 Hiking and kayaking can easily be combined to explore the mountains and lakes of Bariloche. On this privately-guided, full-day excursion by Meridies expeditions, we first drive to Lopez Bay and hike to the Tristeza lookout point. This is an easy and well-traveled trail which ends on a beautiful granite dome with great vistas, a wonderful site to enjoy a picnic lunch. After returning to the trailhead, we will hop into our boats to paddle in the Moreno Lake for the rest of the afternoon. The excursion includes two-person kayaks, certified guide and support vehicle. Return to your hotel. Dinner and overnight in the Llao LLao Hotel & Resort -- Lake Room (De Luxe) or Deluxe Moreno Lake Studio (Imperial) -- King Bed. Day 7: Bariloche - Iguazu Falls. This morning, choose among the activities offered by the hotel. Transfer to the Bariloche airport for a flight to Buenos Aires and the connection to Iguazu Falls. Box lunch prepared by the Llao Llao Hotel & Resort. Arrival at Iguazu Falls, reception and transfer to your hotel. Orient-Express Hotels is restoring the beautiful colonial-style architecture of Hotel das Cataratas. Dinner on the veranda of the hotel's Itaipu restaurant. Overnight in the Hotel das Cataratas -- Deluxe Room with Waterfall View (De Luxe) or Junior Suite (Imperial) -- King Bed. Day 8: Iguazu Falls. Your guide will meet you for a walking and boating excursion on the Brazilian and Argentine sides of Iguazu Falls, including the upper and lower trails, San Martin Island and Devil's Throat. Iguazu Falls is considered by many the most spectacular waterfall in the world, perhaps because of the more than 200 streams that suddenly appear from the rainforest to form a myriad of cataracts, large and small, which mingle and blend so graciously with the surrounding vegetation. For this reason, Iguazu Falls have been declared a World Heritage Site. Picnic lunch prepared by Hotel das Cataratas. Dinner at the hotel's Itaipu restaurant. Overnight in the Hotel das Cataratas -- Deluxe Room with Waterfall View (De Luxe) or Junior Suite (Imperial) -- King Bed. Day 9: Iguazu Falls - Buenos Aires. Morning visit to the Parque de Aves, where rare and colorful birds fly in huge aviaries that guests are able to enter. Transfer to the Iguazu airport for the flight to Buenos Aires. Box lunch prepared by Hotel das Cataratas. Arrival in the Domestic Airport, reception and transfer to the International Airport for your flight home. Dinner on board. Las Violetas, Buenos Aires, Argentina. Photo: Faena Hotel+Universe. Luxury Argentina Tours & Travel . Arrival this morning at the Ezeiza International Airport, reception and transfer to your luxury boutique hotel, Legado Mítico. Each room is themed to a prominent personality in the history and culture of Argentina. Lunch at Las Violetas (with its famous stained-glass windows). This afternoon, choose from a wealth of cultural excursions reflecting the sophistication of this great metropolis, such as Arts & Crafts by Georgina Kiernan, an expert in Latin American contemporary art. It features visits to galleries, art exhibitions, street fairs and artists' studios. Or take in The Museum Mile, where you will view world-class collections of Latin American, Argentinean and European art. Return to your hotel. Dinner of nouvelle French cuisine by chef Rodrigo Sieiro at Nectarine. Overnight in Legado Mítico. 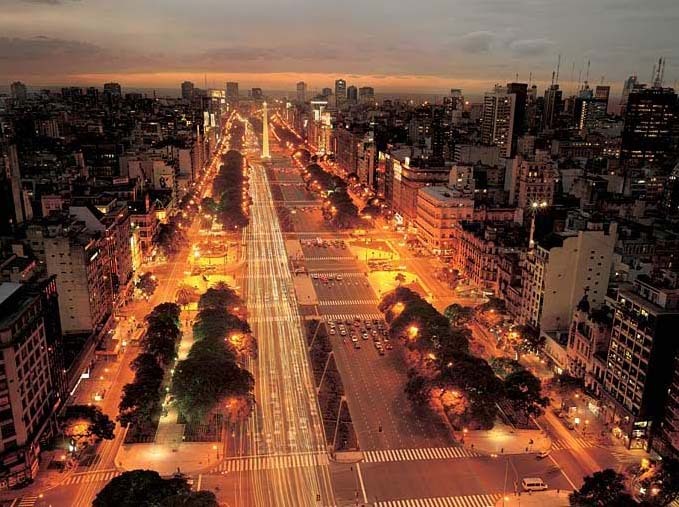 Avenida 9 de Julio, Buenos Aires, Argentina. Photo: Faena Hotel+Universe. Luxury Argentina Tours & Travel. Plaza de Mayo, the heart of the city of Buenos Aires both from the historical and political point of view, and the site of its foundation. Parque Lezama and La Boca as the old South. One of the oldest districts in the city, crowded by artists' ateliers and colorful houses of rambling architecture at La Boca and lots of antique shops and cobblestone streets in San Telmo, which showcase the early times of Buenos Aires. Plaza San Martin and Retiro shows the link and the passage from the old South to the new residential quarters developed at the turn of the 19th century, when Argentina and especially Buenos Aires looked to Europe as a role model. Recoleta, the sophisticated and stylish district in Buenos Aires with a strong French influence to be noted in its architecture, avenues and barrios. We will include a visit to the world famous Recoleta Cemetery where Evita Peron is buried. Lunch at El Alvear Palace Hotel's L'Orangerie. This restaurant has a dress code that requires "smart casual" attire. Shorts, sandals and sleeveless t-shirts are not allowed. In the afternoon, choose from a wealth of cultural excursions, reflecting the sophistication of this great metropolis, such as Wine Tasting by Alejandro Frango. With your guide -- a true connoisseur -- you will sample a selection of the best Malbecs of Argentina, perhaps the best in the world. The Jesuits brought the vines to America, and from the Estancia of Jesus Maria in the Province of Cordoba, Argentina, in 1638, they exported the first wine from the New World to Europe. This evening, dinner and a show at El Cabaret, which presents Rojo Tango, the history of Tango from its beginnings in the cabarets of turn-of-the-century Buenos Aires to Piazzolla's avant-garde vision. Love, passion, madness and glamour are depicted in a show of international standing, in which history becomes legend. Return to your hotel. Overnight in Legado Mítico. Rojo Tango show at El Cabaret. Born in the outskirts of Buenos Aires at the turn of the 19th century, Tango quickly grew to be the best-known Argentine export worldwide. Argentina was and is a true melting pot of cultures. The present population descends mostly from Italians, Spaniards, Arabs and other Europeans. At the end of the last century and the beginning of the current one, large waves of immigrants arrived on the shores of Buenos Aires. They escaped from wars and persecutions and had no place to stay. Most settled in large homes, sharing the rooms around a central patio. During the week they searched for jobs and on Saturdays they would get together in the patio to play music, sing and dance. Most were homesick and their songs reflected their feelings. No one knows exactly how the tango was born, but it is, no doubt, the offspring of the melting pot formed by the European immigrants, the "criollos" (native people) and the descendants of the African slaves, who crowded the conspicuous "conventillos" or tenements. Their folk songs were played and danced at every celebration in the shared central patio. Little by little a new tune developed, first only as a dance; lyrics appeared many years later. Higher classes strongly disapproved of this new dance, and it was considered "lascivious" by a contemporary publication. However, in the days before World War I, Tango appeared in Europe and, although the aristocracy prohibited it, it soon became the rage. Back home, new media -- recordings, radio, and cinema -- gave this dance its final thrust. Carlos Gardel, the first Tango international superstar, imposed a definite style for Tango singers and conquered forever the heart of the "porteños" (residents of Buenos Aires). Many fans still insist "every day he sings better". His portrait is seen hanging from walls and buses along with other mythical characters of political or religious background. Thus, Tango was sung and danced at every party or gathering, formal or not, throughout Argentina. Parents taught their children to dance it at home, although more than one lesson was needed to master it. Regretfully, Tango lost its grip in the 50s when the great names of Tango were disappearing from the scene and new forms of music appeared, especially rock. However, it was still heard, mostly by the radio and TV audiences and danced in a few traditional neighborhood clubs on Saturday nights. The future of Tango seemed uncertain. New generations found it old fashioned and extremely difficult to dance, but it was so rooted in most Argentine families that its disappearance was unlikely. Tango's recent revival abroad gave new hope of its rebirth in the Río de la Plata, its humble cradle a century ago. On the other hand, contemporary musicians such as Piazzolla did and are adapting the Tango to modern times. This, together with its success abroad has called it to the attention of young generations, who have rediscovered this sensual dance. Breakfast. 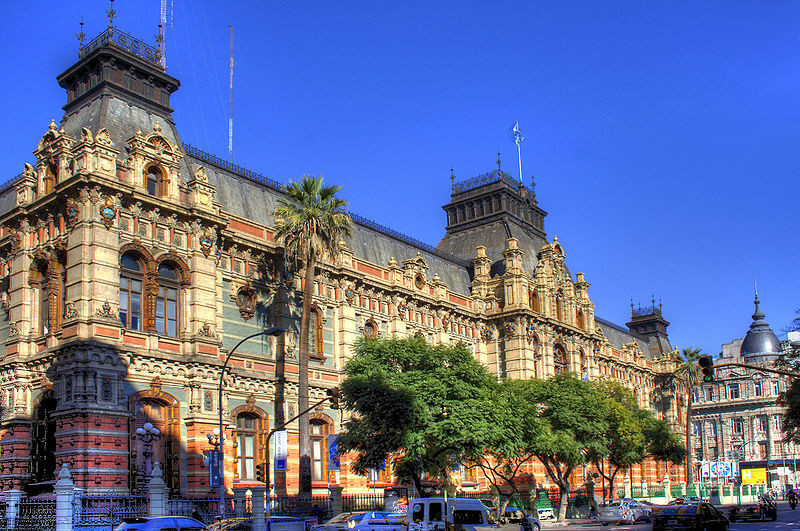 This morning's architectural tour, Buenos Aires through the Centuries, encompasses the Babel of styles generated in four hundred years of the city's history -- from Colonial to Neoclassicism, Italianate, French Academicism, British Influence, Art Nouveau, Industrial Architecture, Art Deco, Rationalist and Post-Modern. Lunch at Croque Madame. Transfer to Aeroparque Domestic Airport for the flight to El Calafate. Arrival, reception and transfer to Hostería Alta Visita. Dinner and overnight in the Hostería Alta Vista. Perito Moreno Glaciar, Los Glaciares National Park, El Calafate, Argentina. Photo: Luca Galuzzi. Luxury Argentina Tours & Travel. Breakfast. A full-day tour of Perito Moreno Glacier with a hike over the glacier. Perito Moreno Glacier is the Los Glaciares National Park's most famous and imposing glacier. It is permanently advancing along its 3-mile-wide front, which is a wall 200 feet high over Lake Argentino. Visitors invariably observe great blocks of ice breaking loose from this wall and falling thunderously into the lake, making huge waves, later surfacing to form icebergs. We leave El Calafate and drive for about two hours on a paved road that leads to the most famous glacier in South America, Perito Moreno, in Los Glaciares National Park. The first views of the glacier are breathtaking vistas down a narrow arm of Lago Argentino with the imposing Andes mountains as a backdrop. As spectacular as the distant views are, they pale in comparison to a close approach, where the constant sounds of this "living" glacier shake the air. Upon arrival, we will board a boat to cross Lago Argentino to the towering ice walls at the front of Perito Moreno Glacier and navigate around the ice blocks that are constantly calving from it. Gigantic blocks of ice, frequently break away and crash into the lake, sending spray hundreds of feet into the air and sounding like distant artillery fire. The startling contrast of color, sound, motion and size creates a continuously changing mosaic of indescribable beauty. We will land on an uninhabited beach where guides will welcome you and lead you to a small shelter. Picnic lunch prepared by Los Notros. After checking the last details, groups of 20 follow their guide along the lake’s shore toward the edge of the glacier. Guests will receive crampons and guides will explain their use. (Neither additional equipment nor previous experience are needed). The wildlife of the area includes Andean condors, buff-necked ibis, black-chested buzzard eagles and ashy-headed geesem, among other creatures. The two hours circuit that follows introduces you to the fascinating landscape of the glaciers: streams, small lagoons, gullies, crevasses and plenty of ice formations of the most incredible blues. The trekking is moderate. The ice surface over which you walk is irregular, but firm and safe. After the walk, a stroll through the forest brings you back to the shelter. Return to the pier and enjoy spare time at the catwalks to simply enjoy and be mesmerized by the constantly calving of ice of this amazing glacier. The different cerulean colors, altitude, capricious formations and roar of the calving are all part of this experience. Return to your hotel. Dinner and overnight in the Hostería Alta Vista. Hostería Alta Visita, El Calafate, Argentina. Photo: Hostería Alta Visita. Luxury Argentina Tours & Travel. Breakfast. Choose from a variety of activities at the hotel. Lunch at Alta Vista. Transfer to El Calafate airport to take the flight to Bariloche. Arrival, reception and transfer to the Llao Llao Hotel & Resort. This hotel is a destination in itself, a beautiful building located in one of the most amazing landscapes in Patagonia. Undoubtedly one of the most extraordinary landscapes in the Western Hemisphere is found in the Meridional Andes. For this reason, a chain of Argentine national parks protects this natural beauty. Numerous large lakes fed by glacial run-off reflect the majesty of the snow-capped peaks. The mountainsides are covered by primeval forests of subantarctic beech forest, such as the lenga which changes color spectacularly in autumn, the coihue which grows in the moister zones around the lakes and rivers, and the pellin which looks like an oak. 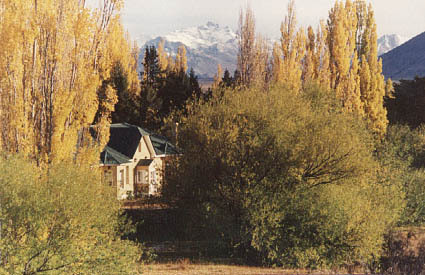 The Northern Lake District goes from Lake Alumine in the North to Esquel in the South and encompasses four national parks, from North to South: Lanin National Park (San Martin de los Andes), Nahuel Huapi National Park (Bariloche), Lago Pueno National Park (El Bolson) and Los Alerces National Park (Esquel). Dinner and overnight in the Llao LLao Hotel & Resort. 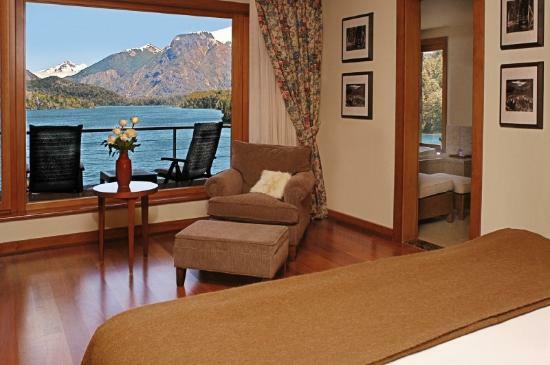 Deluxe Lake Moreno Studio, Llao Llao Hotel & Resort, Bariloche, Argentina. Breakfast. Hiking and kayaking can easily be combined to explore the mountains and lakes of Bariloche. On this privately-guided, full-day excursion by Meridies expeditions, we first drive to Lopez Bay and hike to the Tristeza lookout point. This is an easy and well-traveled trail which ends on a beautiful granite dome with great vistas, a wonderful site to enjoy a picnic lunch (special diets can be arranged if indicated in advance). After returning to the trailhead, we will receive a safety-and-skills briefing by the guide and hop into our boats to paddle in the Moreno Lake for the rest of the afternoon. The excursion includes two-person kayaks (which are safe and stable), certified guide and support vehicle. The level of difficulty and itinerary can be adapted to the guest's physical condition and desires in order to guarantee an enjoyable and memorable experience. The suggested gear for kayaking is comfortable clothes, sunscreen and sunglasses. We suggest wearing shoes that can protect feet from cuts and abrasions from rocks and sharp stones, in case it is necessary to walk on the river floor. Tennis shoes are an example of suitable footwear. Bring a towel and leave a change of clothes and shoes in the vehicle at the take-out spot. Return to your hotel. Dinner and overnight in the Llao LLao Hotel & Resort. Photo: Ideia Travel. Luxury Argentina Tours & Travel. Breakfast. This morning, choose among the activities offered by the hotel. Transfer to the Bariloche airport for a flight to Buenos Aires and the connection to Iguazu Falls. Box lunch prepared by the Llao Llao Hotel & Resort. Arrival at Iguazu Falls, reception and transfer to your hotel. Orient-Express Hotels has restored the beautiful colonial-style architecture of Hotel das Cataratas. Dinner on the veranda of the hotel's Restaurante Itaipu. Overnight in the Hotel das Cataratas. Video: blueplanetvideos.com. Luxury Argentina Tours & Travel. Breakfast. Your guide will meet you for a walking and boating excursion on the Brazilian and Argentine sides of Iguazu Falls, including the upper and lower trails, San Martin Island and Devil's Throat. The Amazon jungle reaches into Argentina along the banks of the major rivers (Parana, Uruguay, Paraguay and others). As we travel north from Buenos Aires, the network of jungle-bordered rivers constitutes a biological corridor through which fauna moves. The highlight of the region is Iguazu Falls, considered by many the most spectacular waterfall in the world, perhaps because of the more than 200 streams that suddenly appear from the rainforest to form a myriad of cataracts, large and small, which mingle and blend so graciously with the surrounding vegetation. For this reason, Iguazu Falls have been declared a World Heritage Site. Picnic lunch prepared by Hotel das Cataratas. Dinner at the hotel's Restaurante Itaipu. Overnight in the Hotel das Cataratas. Swimming pool, Hotel das Cataratas, Iguazu Falls, Argentina. 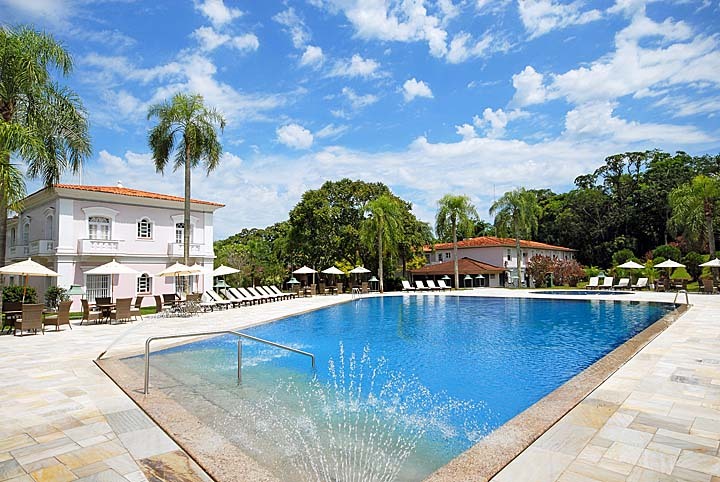 Photo: Hotel das Cataratas. Luxury Argentina Tours & Travel. Breakfast. Morning visit to the Parque das Aves, where rare and colorful birds fly in huge aviaries that guests are able to enter. Transfer to the Iguazu airport for the flight to Buenos Aires. Box lunch prepared by Hotel das Cataratas. Arrival in the Domestic Airport, reception and transfer to the International Airport for your flight home. Dinner on board.